Xue Feng Wei has been a member of the first violin of Vancouver Symphony Orchestra since 1998. 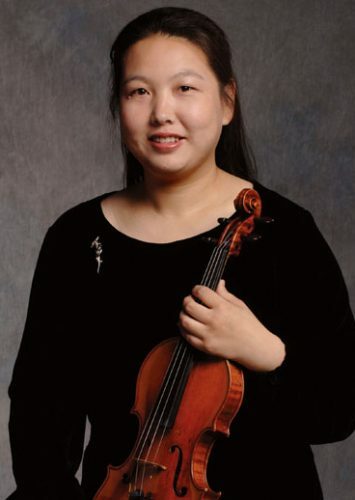 She began studying violin at age nine in the China Central Conservatory of Music in Beijing, where she studied with Professor Xiao-Zhi Huang, Wei-jian Zhao and Hua-Cheng Si Tu. She earned her Bachelor degree. Xue Feng served as the Concertmaster assistant of the National Chamber Orchestra in China from 1988 to 1994. She has played as a soloist with the Beijing Symphony Orchestra, Guangzhou Symphony Orchestra and the National Chamber Orchestra. She moved to Bogota, Colombia in 1994. As the Concertmaster assistant of Philamonic Orchestra de Bogota, she also performed Brahms, Bruch and Prokofiev violin concertos with the orchestra. She moved to Vancouver, Canada in 1998.